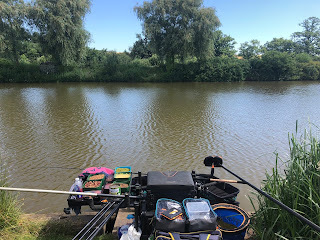 No match this weekend so I decided to head back to Badshot Lea small pond, peg 38 to test a theory I had after my previous weeks match. The theory? Well more groundbait on one line to hold the larger fish together with some hook bait changes. 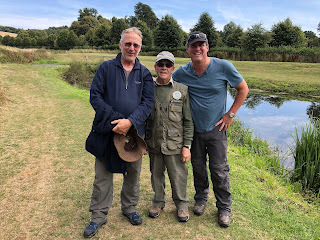 Weather was very similar to the previous week together with quite a few carp anglers at the bottom end which almost simulated the match conditions of the previous week. My aim was to start my "match" at 10:30am and fish until around 2pm. Longer feeder line this time, just short of mid way. 14.5 metre lines same as the match, 11 and 2 o'clock. 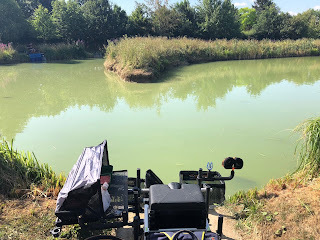 I set up two different pole rigs this time, one that was around an inch overdepth and the other a double bulk where the second smaller bulk where actually on the deck looking for the tell tail lift bites. Bait, maggot, caster, micro and 6mm pellet. Groundbait was a 50/50 mix of a method mix and dark sweet fishmeal F1. Rather than pot in 8 balls of groundbait on the right hand line laced with half a pint of casters I adopted the old school method of balling in and I was pleasantly surprised at my accuracy! I then mixed enough ground bait with half a pint of micros for the left hand line, which was enough for 4 groundbait balls, this time cupping them in with the pole in a 1 metre square pattern, I would ping casters over this line every 5 minutes. The feeder line I had clipped up at a longer distance than the match, just short of the midway point to see if there would be more fish at range and went through the same pattern of 2 minute casts with a 5 hole cage feeder before swapping to a mini 3 hole cage feeder. Initial hook bait was double dead red maggot and the first fish came on the 30 minute mark. 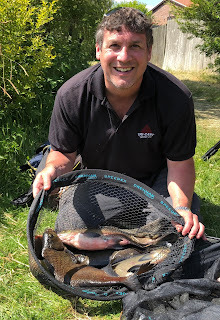 The longer feeder line wasn't producing as it did last week and on the 90 minute mark I only had one fish in the net for my time so I decided to shorten back up to around a 20 metre chuck between my two pole lines. For the next 30 minutes adopting the cast every 2 minute mark to get a bed of bait down however still no bites. A quick look on the pole lines with double dead red maggot using both the full depth and double bulk rigs for some small roach, so I decided to go back on the feeder however this time I changed the hooklength so I could band a 6mm pellet. The change was instant with the tip nodding around and a large bream of around 3lb in the net. It was quickly followed by another two fish of similar size, would the large fish be on the pole lines too? Rather than changing the pole hooklengths, I grabbed a small band and attached it directly to the hook. The first rig I used was the overdepth "lift" bite on the right hand line. Well it wasn't a lift bite, rather the float sailed away with a large slab at the end of the line. I took large bream from both the pole lines and it was clear that the banded pellet was the key to the larger fish not the amount of feed in the swim as both pole lines started to produce slabs of bream. 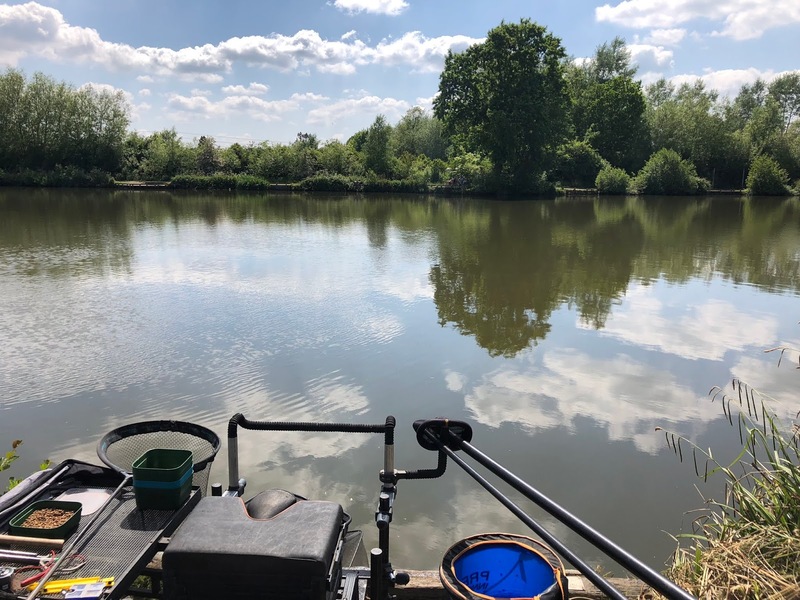 After three and half hours I started to pack up happy with my efforts for the day and looking forward to my next match at this lovely pond. No perch at all today, just lovely big slabs of bream, some hybrids and roach. The banded 6mm pellet was the key to hooking the better stamp of fish and avoiding the roach. With eight good bream in the net, I estimated around 35lb after three and a half hours.